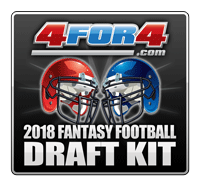 Here is everything you need for your 2018 fantasy draft. We provide you with Cheat Sheets, Projections, Rankings, Analysis, and Draft software. All you have to do is subscribe. A premium subscription includes much more than just the Draft Kit -- you get week-to-week rankings and analysis all season long, member-only contests, your own personal team consultants on the forum, and much, much more. 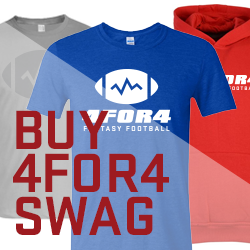 Check out our friends at DLF for more dynasty focused content. 4for4 subscribers receive FREE access to the Draft Analyzer web (mobile) and desktop versions with 4for4's award winning projections, a $24 value. Pro and DFS subscribers get access to Auction Analyzer as well. Sleepers, breakouts, draft strategy and more. Full draft breakdowns as 4for4 staff battles Draft Analyzer in mock drafts from various drafts spots and league configurations. Coming soon.